The mining sector is a crucial economic sector for many countries and includes the utilization of metallic and nonmetallic minerals. Owing to their severe and frequent mining injuries, illnesses and fatalities it has been considered as one of the major hazardous work environments in many countries around the world. The past record of occupational hazards continues to show a significant decline and the number of fatalities has dropped from 267 in 1979 to 55 in 2004 as reported by Mine Safety and Health Administration. The approximate common daily employment in the Indian mining sector is 5,60,000, which includes 87% of the public sector and 13% in the private sector. Eight hundred of these mines are in the public sector and 2,300 mines in the private sector and the approximate average daily employment in the mining sector is 5,60,000, 4,90,000 (87%) in the public sector and 70,000 (13%) in the private sector, two of which around 70,000 work in metallic mines. , The mine workers are regularly exposed to dust of various potential pollutants and toxicants present in the mining environment such as chromium, lead, mercury, cadmium, manganese, aluminium, fluoride, arsenic, etc. Inhalation and absorption through the skin are common routes of exposure. 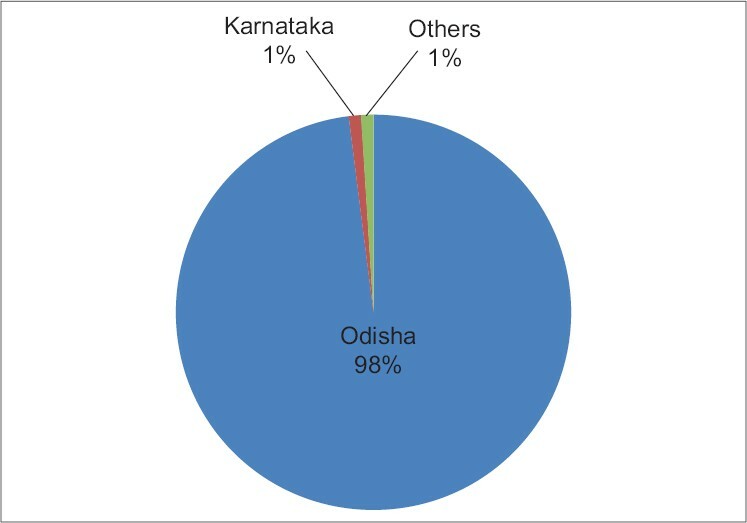 India's rich mineralogical resources are spread over broad geographical location and the Indian mining sector occupies nearly 1.5 million persons directly/indirectly. 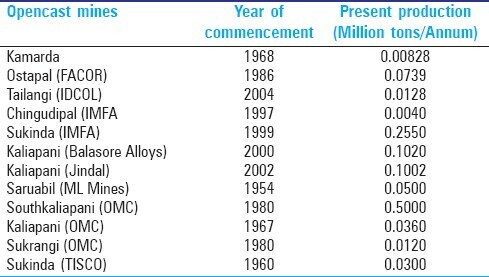 In world production, India ranked second in chromite, barites, and talc, third in coal and lignite, fourth in iron ore, sixth in bauxite and seventh in manganese in 2002-03. Chromium (Cr) is considered an essential nutrient and a health hazard. Specifically, Cr in oxidation state +6, is considered harmful even in small intake quantity whereas Cr in oxidation state +3, is considered essential for good health in moderate intake. The federal maximum concentration level (MCL) for total Cr in drinking water is 100 μg/L,  the California MCL is 50 μg/L  and the National Institute for Occupational Health and Safety (NIOSH) recommends an exposure limit for Cr(VI) of 1 μg/m 3 and an exposure limit for Cr (0), Cr (II) and Cr (III) of 500 μg/m 3 for a 10-hour workday, 40-hour week. Approximately 35% of Cr released from all anthropogenic sources is Cr (VI). Human activity further contributes to Cr in the environment (air, surface water, groundwater, soil). The greatest anthropogenic sources of Cr (VI) emissions are: (1) chromite mining, (2) Cr plating, (3) chemical manufacturing of Cr and (4) evaporative cooling towers. Due to toxicity concerns, in the USA concentration of total Cr are regulated at 0.1 mg/L in drinking water, 5 mg/L leached from solids in the toxicity characteristic. The hexavalent form is relatively soluble and can move more readily through soil to groundwater. The typical ratio of chromium in plants to chromium in soil is estimated at 0.0045 (or 0.45%). EPA has set a limit of 100 μg Cr (III) and Cr (VI) per liter of drinking water (100 μg/L). The Occupational Safety and Health Administration (OSHA) has set limits of 500 μg water-soluble Cr (III) compounds per cubic meter of workplace air (500 μg/m 3 ), 1,000 μg/m 3 for metallic chromium (0) and insoluble chromium compounds and 52 μg/m 3 for chromium (VI) compounds for 8-hour work shifts and 40-hour work weeks. 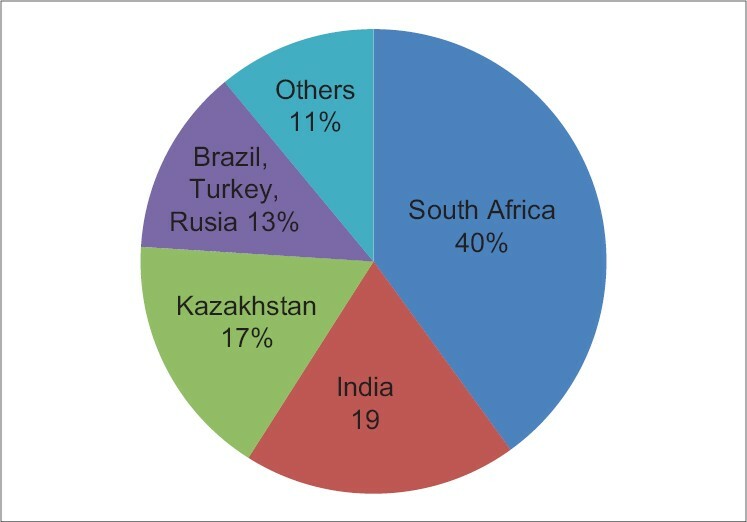 Last year in 2009 world chromite ore production for South Africa accounted 33%, Kazakhstan and India provided 17% and 29%, respectively. Brazil, Russia and Turkey together contributed 13%, while some 12 smaller producer countries brought the balance of 11% [Figure 1] as reported by International chromium development authority. Indian health and safety association and industries, of government and private sectors, are involved in progress to reduce the number of occupational health hazards due to mining. However, the existing gaps in health and safety, safety laws and actions can be developed in the standard or in short-term. Chromium (VI) in environment contamination has generally been assumed to be anthropogenic, since it is used in a number of industrial applications, including mining, electroplating, tanning, Industrial water-cooling and petroleum refining. It's been long years since it was first noticed that workers in the chrome ore manufacturing developed lung cancer more often than the rest of the population. Occupational exposures to Cr (VI) compounds can be quite severe (Environmental Health Perspectives) although breathing in Cr (VI) at concentrations as low as 2 μg/m 3 can cause sneezing and irritation of the nasal mucosa, air concentrations of Cr (VI) compounds can get much higher than that in certain workplace settings. In chrome plating workshops with local exhaust, for example, concentrations usually range from 10 to 30 μg/m 3 ; in shops without local exhaust, concentrations can climb to 120 μg/m 3 . Hexavalent chromium [Cr (VI)] a strong oxidizing agent, is potentially mutagenic, , carcinogenic, ,, potent inducers of tumors in experimental animals; ,, immunotoxic, neurotoxic, reproductive toxic, genotoxic and can induce a wide spectrum of DNA damage, gene mutations, sister chromatid exchanges,  and chromosomal aberrations. , It is regularly introduced into the environment through diverse anthropogenic activities, including electroplating, leather tanning, and pigment manufacturing. Hexavalent chromium acts as both sensitizer and irritant when it comes in contact with skin. Cr (VI) gets reduced to trivalent chromium, after entering the organism, and then binds to proteins and creates haptens which trigger immune system reaction. Once developed, chrome sensitivity becomes fairly persistent; in such cases, even contact with chromate-dyed textiles or wearing of chromate-tanned leather shoes can cause or exacerbate dermatitis. Chromium contaminated when inhaled, chromium particles can be deposited in the lungs and those deposited in the upper part of the lungs are usually coughed up and swallowed. Some that deposit deep in the lungs can dissolve, which allows chromium to pass through the lining of the lungs and enter the bloodstream. The finding of deadly effects following dermal exposure suggests that chromium is absorbed through the skin, although information on the percent absorbed is limited. In the bloodstream, chromium moves to all parts of the body where hexavalent chromium is reduced to trivalent chromium in the body by enzymatic reactions. Ingestion of food is the key source of chromium exposure for most people in the US. On average, adults take in an estimated 60μg of trivalent chromium every day with their food. A small amount - about 0.5% of Cr III and 10% of Cr VI - will pass through the lining of the intestines and enter the bloodstream. From there, chromium is distributed to all parts of the body. It then passes through the kidneys and is eliminated in the urine in a few days. The trivalent form in food can attach to other compounds that make it easier for chromium to be absorbed and enter the bloodstream from the stomach and intestines. [Table 2] describes the route of occupational exposure to Cr (VI) and its detrimental health effects. Hexavalent chromium compounds have been confirmed to be carcinogenic on the basis of epidemiologic investigations of workers and of experimental studies with animals. , Continuous inhalation of hexavalent chromium compounds increases the risk of lung cancer,  with the amount of hazard depending on the particular salts and their solubility under biological circumstances, and on long-term exposure to inhaled tobacco smoke from cigarettes. Epidemiologic studies conducted in the USA 40 years ago, demonstrated a 10 to 30 fold- increased risk of lung cancer among workers of the chromate industry compared to the general population. In most studies, a positive correlation between duration of exposure and lung cancer death was found. Hexavalent chromium is extremely toxic and is considered by the World Health Organization and the United States Environmental Protection Agency to be a human carcinogen. The International Agency for Research on Cancer (IARC) in 1990 concluded that there was sufficient evidence in humans for the carcinogenicity of chromium (VI) compounds as encountered in the chromate production, chromate pigment production, and chromium plating industries for the carcinogenicity of chromium (VI) compounds in humans based on the combined results of epidemiological studies, carcinogenicity studies in experimental animals, and evidence that chromium (VI) ions generated at critical sites in the target cells are responsible for the carcinogenic action observed. The mechanism of carcinogenecity of hexavalent chromium relies on trivalent chromium, an intracellular reduction product after its penetration into the cell. Chromium goes into the body through the lungs, gastrointestinal tract and to a lesser extent through skin. Inhalation is the most important route for occupational exposure, whereas nonoccupational exposure occurs via ingestion of chromium-containing food and water. Regardless of route of exposure Cr (VI) is more readily absorbed which accounts for its toxicological activity and carcinogenicity. All the ingested Cr (VI) is reduced to Cr (III) before entering in the blood stream. The main routes for the excretion of chromium are via kidney/urine and the bile/feces, , High doses of chromium and long term exposure of it can give rise to various, cytotoxic and genotoxic reactions that affect the whole system of the body. However, the mechanism of the Cr (VI)-induced cytotoxicity is not entirely understood. 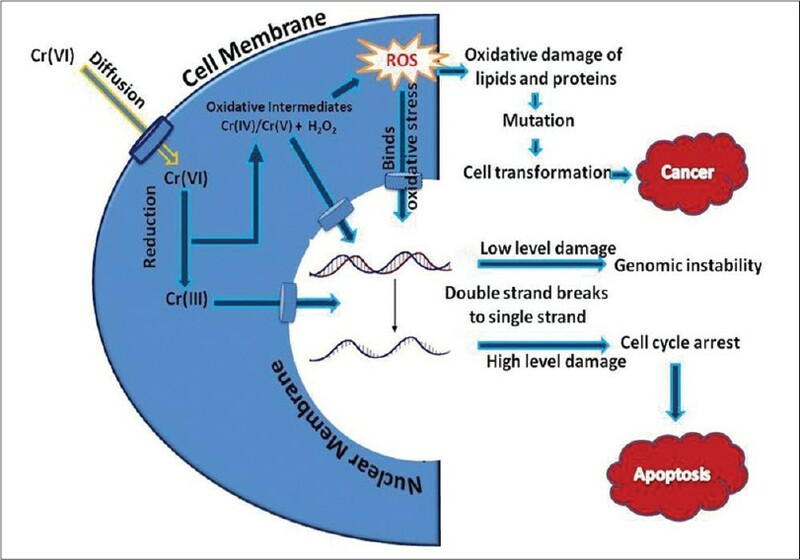 A series of in vitro and in vivo studies have demonstrated that Cr (VI) induces oxidative stress through enhanced production of reactive oxygen species (ROS) leading to genomic DNA damage and oxidative deterioration of lipids and proteins [Figure 3]. Low level of DNA damage leads to genomic instability. The cascade of cellular events occur following Cr (VI)-induced oxidative stress including enhanced production of superoxide anion and hydroxyl radicals, increased lipid peroxidation and genomic DNA fragmentation, modulation of intracellular oxidized states, activation of protein kinase C, apoptotic cell death and altered gene expression. The process by which Cr (VI) is reduced to Cr (III) can cause many forms of DNA damage: oxidative DNA lesions such as strand breaks, chromium-DNA adducts, DNA-DNA interstrand cross-links, and DNA-protein cross-links. Reports, published in the March 1994 issue of Molecular Carcinogenesis specify that Cr (III)-induced DNA-DNA interstrand cross-links are the lesions responsible for blocking DNA replication. This observed mutagenicity complements other studies on Cr (III)-dependent DNA lesions, which demonstrate the importance of a Cr (III)-dependent pathway in Cr (VI) carcinogenicity. The lower respiratory tract is the target organ of Cr (VI) exposure, and its accumulation in lung tissue is found in workers with occupational exposure and in cigarette smokers which clearly shown the higher incidence of lung cancer. , Exposure increases the incidence of lung cancer in cigarette smokers thus the cancer morbidity rate for smokers who were formerly K 2 CrO 4 workers, with 9 or more years of exposure, is 21.6 times higher than that of nonsmokers. Mechanism for lung carcinogenicity involves the intracellular reduction of Cr (VI) to Cr (III) which leads to the extensive formation of DNA-phosphate-based adducts that cause a variety of genetic damage,  which in turn activates the p53 signaling pathway and cell cycle arrest or apoptosis. Also, Cr (VI) induces the ataxia- telangiectasia mutated (ATM)-dependent DNA damage response pathway, which is paradoxically required for both apoptosis and survival after Cr (VI) insult. However, Cr (VI) exposure also causes the inhibition of NER, which is the principal repair mechanism for Cr (VI)-DNA adducts in human cells  which results in enhanced carcinogen-induced mutagenicity and cytotoxicity. Although the inhibition of NER is an important mechanism for Cr (VI)-induced human carcinogenesis, the underlying molecular mechanisms of Cr (VI)-induced carcinogenesis remain unclear. In human primary bronchoalveolar cells tumor suppressor protein, p53 is necessary for Cr (VI)-induced expression of the BH3 domain-containing proteins, PUMA and NOXA. These proteins promote apoptosis through the multidomain Bcl-2 family member, BAX. When PUMA expression was inhibited by specific antisense, no apoptosis was observed. The activated p53 act as a transcription factor to induce the expression of proteins involved in cell cycle arrest or apoptosis. The transcriptional activation of the cyclin-dependent kinase inhibitor CDKN1A (p21waf-1/cip1) is the key event for growth arrest after p53 activation. Alternatively, p53 transactivates a series of proapoptotic proteins from the BCL2 family; in particular, BAX, PUMA and NOXA, , which induce mitochondrial membrane permeabilization and, therefore, release apoptogenic factors from the mitochondrial intermembrane space. p53 can also induce apoptosis in a transcription-independent manner by acting directly at the mitochondrial level,  although the extent of this for DNA damage-induced apoptosis is controversial. Whatever the mechanisms, p53 activates the intrinsic mitochondrial apoptotic pathways in response to DNA damage by inducing the expression of at least three BCL-2 proapoptotic family members (BAX, PUMA and Noxa), shifting the balance toward proapoptotic effects. The formation of apoptosomes requires the release of cytochrome c and APAF-1 from mitochondria. The cytoplasm efflux of cytochrome c is the key event, with consequent mitochondrial release of Smac/DIABLO (second mitochondria-derived activator of caspases), which promotes the transactivation of caspase-9 and downstream effector caspase-3. Caspase-3 executes cell death (25). Lung tissue that has undergone cellular turnover in response to recurrent cytotoxic Cr (VI) exposure may present an attenuated response to subsequent exposures. This implies that individuals with longer term occupational exposure may be more susceptible to Cr (VI)-induced lung cancer due to selection for apoptosis-resistant cells. Overall, our study suggest that the mitochondrial death pathway mediating apoptosis is activated by Cr (VI), and that Cr (VI) is directly genotoxic to relevant lung target cells, such as bronchoalveolar cells. The mechanism for carcinogenicity includes increases in p53 protein levels and transcriptional activation of p53 targets genes, such as PUMA and NOXA, which, in turn, trigger mitochondrial apoptosis. Heavy metal chromium have significant role in altering the immune response by immunostimulatory or immunosuppressive mechanisms. The reduction of Cr (VI) to Cr (III) results in the formation of reactive intermediates that contribute to the cytotoxicity, genotoxicity and carcinogenicity of Cr (VI)-containing compounds. Cr (VI) shows a biphasic pattern, with a stimulatory effect at the lowest concentrations tested and an inhibitory effect at higher concentrations. The proliferation of both T and B cells and the production of immunoglobulins by lipopolysaccharide-stimulated B cells are significantly inhibited by chromium particles after intraperitoneal injection in mice or in vitro experiments on murine lymphocytes. The results indicated that the metal-induced immunosuppression may be an important factor in the development of implant-associated infection in patients with prosthesis. None of the report is available on the effect of chromium on natural killer (NK) cells in vitro. On inhalation of chromium macrophages becomes enlarged, multinucleated or vacuolated and accumulate in intra-alveolar spaces as nodules. Higher doses of Cr (VI) depress the phagocytic activity of alveolar macrophages and the humoral immune response, whereas lower doses of Cr (VI) stimulate phagocytic activity of the alveolar macrophages and increase the humoral immune response. Prabhu et al,  have examined a number of basic biological responses of the J774A.1 cell line, including cell proliferation, apoptosis, cytokines secreted into the culture supernatant (TNF-K, IL-1K, IL-6, and IL-12) and mRNA expression of the cytokines (TNF-K, IL-1K, IL-6, IFN-K, M-CSF and TGF-L) in response to cobalt chrome alloy particles (CoCr). The results indicate that the relative contribution of CoCr particles in J774A.1 activation is negligible and a change in metabolic activity of J774A.1 cells is observed only at higher concentrations of CoCr particles. Khangarot et al,  studied the effects of subtoxic levels of chromium on humoral and cell-mediated immune responses, blood parameters, susceptibility to bacterial (Aeromonas hydrophila) infection and macrophage activity in the freshwater air-breathing Asian cat fish, Saccobranchus fossilis. Fish exposed to chromium have lower spleen weight, lower antibody titer, reduced numbers of splenic plaque-forming cells and higher counts of splenic lymphocytes. Differential leukocyte counts revealed that chromium exposure causes a significant decrease in large and small lymphocytes, whereas neutrophils and thrombocytes increase. Concanavalin A-induced proliferation of splenic and pronephric lymphocytes is decreased. The eye-allograft rejection time is increased. Fish exposed to chromium exhibit higher susceptibility to A. hydrophila infection. The phagocytic activity of splenic and pronephros macrophages is significantly decreased. Chromium is known to have cytotoxic effects on cells. Vasant et al,  have shown that apoptosis is the mode of cell death of human lymphocytes in the presence of both Cr (V) and Cr (VI). Pretreatment of cells with antioxidants, before exposure to Cr (V) complexes, reverses apoptosis partially. The possibility has been suggested for the formation and implication of reactive oxygen species in Cr (V)-induced apoptosis of human lymphocyte cells. In the study of mechanism for effects of chromium on immune functions of body, DNA strand breaks and sister-chromatid exchange (SCE) in blood lymphocytes were used to investigate the toxicity of chromium. Exposure to Cr (VI) can result in various point mutations in DNA and to chromosomal damage, as well as to oxidative changes in proteins which may result in cancer. The economical development of India in the frame of the Asian Union in the last decade has generated a significant enhancement in the quality and competitiveness of its enterprises. Chromite mining in India is at a very critical juncture where workers and their organizations are facing problems like privatization, saving their jobs and there has been a stable decline in the employment in this sector due to mechanization and other cost-cutting measures. In the present day situation occupational safety has taken a lay back and workers have a Hobson's choice of "No Jobs versus Hazardous Jobs". The occupational diseases and hazards do not reveal the actual situation and figures about the mines as the Performance Monitoring and Evaluation System are not carried out properly and also due to lack of qualified doctors in this sector. The need of this investigation is to develop a holistic approach towards occupational health and safety assessment, which should not mean just more personal protective equipment. Determination of chromium concentration in work area should be periodically examined. Characterization and quantification of toxic Cr (VI) in mine environments should be studied. The health checkup of workers must include estimation of Cr (VI) in body fluids and tissues. Alertness concerning avoidance of toxic Cr (VI)-related health hazards in the mining industry should be created among the miners by training and education programs. Regulations should be made for monitoring this toxicant in mining environments and exposed workers. 1. Groves WA, Kecojevic VJ, Komljenovic D. Analysis of fatalities and injuries involving mining equipment. J Safety Res 2007;38:461-70. 2. Leigh J, Waehrer G, Miller T, Keenan C. Cost of occupational injury and illness across industries. Scand J Work Environ Health 2004;30:199-205. 3. Mine Safety and Health Administration (MSHA) 2006. Equipment safety and health information. Available from: http://www.msha.gov. [last cited on 2010 Dec 5]. 4. Dhatrak S, Nandi SS. Risk assessment of chronic poisoning among Indian metallic workers. Indian J Occup Environ Med 2009;13:60-4. 5. Indian bureau of mines. National Mineral Inventory- An Overview. Nagpur; 2000. p. 1-48. 6. Indian bureau of mines. Indian mineral year book. Nagpur; 2004. p. 276-476. 7. Guertin J. Toxicity and Health Effects of Chromium (All Oxidation States), 2004. Available from: http://www.engr.uconn.edu/~baholmen/docs/ENVE290W/.../L1608_C06.pdf. [last cited on 2010 Dec 5]. 8. U.S. Environmental Protection Agency (USEPA). Code of Federal Regulations, 40 CFR 141.32. 1999. 9. Calder LM. Chromium contamination of groundwater, in chromium in the natural and human environments. Wiley Series in Advances in Environmental Science and Technology. Vol 202. New York: John Wiley and Sons; 1988. p. 15-229. 10. Agency for Toxic Substances and Disease Registry (ATSDR). Toxicological Profile for Chromium, U.S. Department of Health and Human Services, Public Health Service, ATSDR; 2000. 11. Das A, Mishra S. Biodegradation of the metallic carcinogen hexavalent chromium Cr (VI) by an indigenously isolated bacterial strain. J Carcinog 2010;9:6. 12. Rao AV, Dhakate, RR, Singh VS, Jain SC. Geophysical and hydrogeological investigations to delineate aquifer geometry at kaliapani, Sukinda, Odisha, NGRI Technical Report No.GW-367. 2003. 13. Available from: http://www.blacksmithinstitute.org/wwpp2007/finalReport2007.pdf. [last cited on 2010 Dec 5]. 14. ENVIS Newsletter. State of Environment: Chromite Mining and Related issues. Available from: http://www.cesOdisha.org/PDF/Newsletter5.pdf. [last cited on 2010 Dec 5]. 15. Cheryl P. Environmental Health Perspectives. 2000. p. 108. Available from: http://www.mindfully.org/Pesticide/Hexavalent-Chromium-Health-Hazards.htm. [last cited on 2010 Dec 5]. 16. Das A, Mishra S. Hexavalent Chromium (VI): Health hazards and environmental pollutant. J Environ Res Dev 2008;2:386-92. 17. Langard S. Biological and Environmental Aspects of Chromium. New York: Elsevier; 1982. 18. International Agency for Research on Cancer (IARC). IARC Monographs on the Evaluation of Carcinogenic Risks to Humans. Vol 49. WHO: Lyon; 1990. p. 49-256. 19. Langard S. One hundred years of chromium and cancer: A review of epidemiological evidence and selected case reports. Am J Ind Med 1990;17:189-215. 20. Agency for Toxic Substances and Disease Registry (ATSDR). Toxicological Profile for Chromium, U.S. Department of Health and Human Services, Washington, DC; 1993. 21. O'Brien TJ, Ceryak S, Patierno SR. Complexities of chromium carcinogenesis: Role of cellular response, repair and recovery mechanisms. Mutat Res 2003;533:3-36. 22. Manning FC, Blankenship LJ, Wise JR, Xu J, Bridgewater LC, Patierno SR. Induction of internucleosomal DNA fragmentation by carcinogenic chromate: Relationship to DNA damage, genotoxicity, and inhibition of macromolecular synthesis. Environ Health Perspect 1994;102:159-67. 23. Xie H, Holmes AL, Wise SS, Gordon N, Wise JP. Lead chromate-induced chromosome damage requires extracellular dissolution to liberate chromium ions but does not require particle internalization or intracellular dissolution. Chem Res Toxicol 2004;17:1362-7. 24. State Master Encyclopedia. Available from: http://www.statemaster.com/encyclopedia/Hexavalent-chromium. [last cited on 2010 Dec 5]. 25. Flora S. Threshold mechanisms and site specificity in chromium (VI) carcinogenesis. Carcinogenesis 2000;21:533-41. 26. Norseth T. The Carcinogenicity of Chromium. Environ Health Perspect 1981;40:11-130. 27. James A. Role of epidemiologic studies in evaluating the carcinogenicity of chromium compounds. Sci Total Environ 1989;86:169-79. 28. Urbano M, Carlos FD, Alpoim M. Hexavalent chromium exposure, genomic instability and lung cancer. Gene Ther Mol Biol 2008;12:219-38. 29. Hohlfeld I. Environmental and occupational risk factors for lung cancer. Methods Mol Biol 2008;472:3-23. 30. Hertel RF. Sources of exposure and biological elects of chromium. IARC Sci Publ 1986;71:63-77. 31. US Environmental Protection Agency (1984) Health effects assessment for hexavalent chromium. Prepared by the Office of Health and Environmental Assessment, Environmental Criteria, EPA/540/ 1-86-019 Cincinnati, updated 1998. 32. Bagchi D, Bagchi M, Stohs SJ. Chromium (VI)-induced oxidative stress, apoptotic cell death and modulation of p53 tumor suppressor gene. Mol Cell Biochem 2001;222:149-58. 33. U.S. Environmental Protection Agency (EPA). Toxicological Review of Trivalent Chromium. National Center for Environmental Assessment, Office of Research and Development, Washington, DC. 1998. 34. World Health Organization (WHO). Chromium Environmental Health Criteria 61. Geneva, Switzerland. 1988. 35. Leonard A, Lauwerys RR. Carcinogenicity and mutagenicity of chromium. Mutat Res 1980;76:227-39. 36. Levy LS, Vanitt S. Carcinogenicity and mutagenicity of chromium compounds: The association between bronchial metaplasia and neoplasia. Carcinogenesis 1986;7:831-5. 37. DeFlora S, Wetterhahn KE. Mechanisms of chromium metabolism and genotoxicity. Life Chem Rep 1989;7:169-244. 38. Wise SS, Elmore LW, Holt SE, Little JE, Bryant BH, Wise JP. Telomerase-mediated lifespan extension of human bronchial cells does not affect hexavalent chromium-induced cytotoxicity or genotoxicity. Mol Cell Biochem 2004;255:103-11. 39. Holmes AL, Wise SS, Xie H, Gordon N, Thompson WD, Wise JP. Lead ions do not cause human lung cells to escape chromate-induced cytotoxicity. Toxicol Appl Pharmacol 2005;203:167-76. 40. Hayes RB. Review of occupational epidemiology of chromium chemicals and respiratory cancer. Sci Total Environ 1998;71:331-9. 41. DeFlora S, Bagnasco M, Serra D, Zanacchi P. Genotoxicity of chromium compounds. Mutat Res 1990;278:99-172. 42. Bridgewater LC, Manning FC, Patierno SR. Arrest of replication by mammalian DNA polymerases alpha and beta caused by chromium-DNA lesions. Mol Carcinog 1998;23:201-6. 43. Wakeman TP, Kim WJ, Callens S, Chiu A, Brown KD, Xu B. The ATMSMC1 pathway is essential for activation of the chromium [VI]-induced S-phase checkpoint. Mutat Res 2004;554:241-51. 44. Sancar A. DNA excision repair. Annu Rev Biochem 1996;65:43-81. 45. Russo P, Catassi A, Cesario A, Imperatori A, Rotolo N, Fini M, et al. Molecular mechanisms of hexavalent chromium-induced apoptosis in human bronchoalveolar cells. Am J Respir Cell Mol Biol 2005;33:589-600. 46. Pommier Y, Sordet O, Antony S, Hayward RL, Kohn KW. Apoptosis defects and chemotherapy resistance: Molecular interaction maps and networks. Oncogene 2004;23:2934-49. 47. Nakano K, Vousden KH. PUMA, a novel proapoptotic gene, is induced by p53. Mol Cell 2001;7:683-94. 48. Han J, Flemington C, Houghton AB, Gu Z, Zambetti GP, Lutz RJ, et al. Expression of bbc3, a pro-apoptotic BH3-only gene, is regulated by diverse cell death and survival signals. Proc Natl Acad Sci U S A 2001;98:11318-23. 49. Wang JY, Wicklund BH, Gustilo RB, Tsukayama DT. Prosthetic metals impair murine immune response and cytokine release in vivo and in vitro. J Orthop Res 1997;15:688-99. 50. Glaser U, Hochrainer D, Kloppel H, Kuhnen H. Low level chromium (VI) inhalation effects on alveolar macrophages andimmune functions in Wistar rats. Arch Toxicol 1985;57:250-6. 51. Prabhu A, Shelburne CE, Gibbons DF. Cellular proliferation and cytokine responses of murine macrophage cell line J774A.1 to polymethylmethacrylate and cobalt-chrome alloy particles. J Biomed Mater Res 1998;42:655-63. 52. Khangarot BS, Rathore RS, Tripathi DM. Elects of chromium on humoral and cell-mediated immune responses and host resistance to disease in a freshwater catsh, Saccobranchus fossilis (Bloch). Ecotoxicol Environ Saf 1999;43:11-20. 53. Vasant C, Balamurugan K, Rajaram R, Ramasami T. Apoptosis of lymphocytes in the presence of Cr (V) complexes: Role in Cr (VI)-induced toxicity. Biochem Biophys Res Commun 2001;285:1354-60. 54. Albert S, Alfonso L, Palmer BC, Juan J, Montan O, Rafael J, et al. Occupational safety and health in Spain. J Safety Res 2002;33:511-25. 55. Vijayana GI, Nikos M. Unsafe Chromium and its Environmental Health Effects of Odisha Chromite Mines. Proceedings of the International Conference on energy and environment technologies and equipment. 2010:1790-5095. 56. Rastogi SK, Pandey A, Tripathy S. Occupational health risks among the worker employed in leather tanneries at Kanpur. Indian J Occup Environ Med 2008;12:132-5. 57. Thompson RC, Hilton TF, Witt LA. Where the safety rubber meets the shop floor: A confirmatory model of management influence on workplace safety. J Safety Res 1998;29:15-24. Dhal, B. and Thatoi, H.N. and Das, N.N. and Pandey, B.D. Lupescu, A. and Jilani, K. and Zelenak, C. and Zbidah, M. and Qadri, S.M. and Lang, F.